The Stage Awards’ Unsung Hero category usually goes to someone whose modesty or low profile belies their dedication, excellence and long service. This year’s recipient Clare Ferraby ticks all those boxes and, in theatrical terms, is more than justified to claim the “hero” tag that comes with the award. 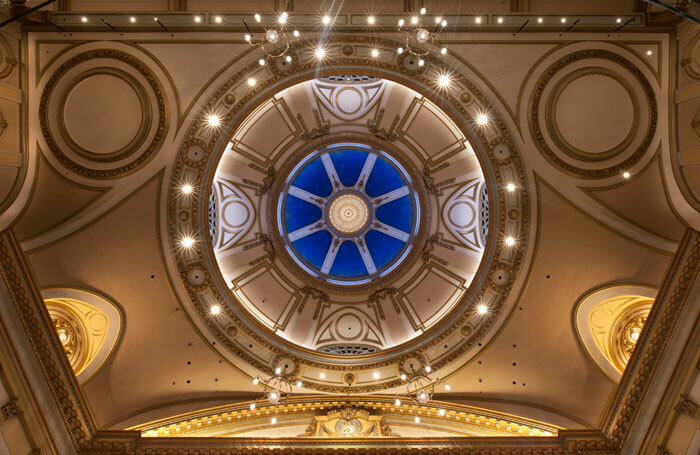 Now in her 80th year, the long-time doyenne of theatrical interior design has just completed her biggest job to date – the refurbishment of the Victoria Palace, the London home of musical phenomenon Hamilton. This would have been a colossal job for anyone in the peak of good health; that Ferraby suffered two strokes over the three-year duration of the job makes her achievement all the more remarkable. As Cameron Mackintosh, owner of the Victoria Palace, told The Stage, the restoration “could never have been achieved without her”. 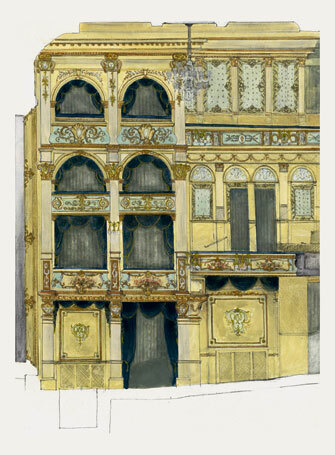 Even after the strokes, he continued: “Indomitably, cane in hand, she managed to create an extraordinary colourful and exhilarating temple of theatrical magic and light that will certainly last for another hundred years. 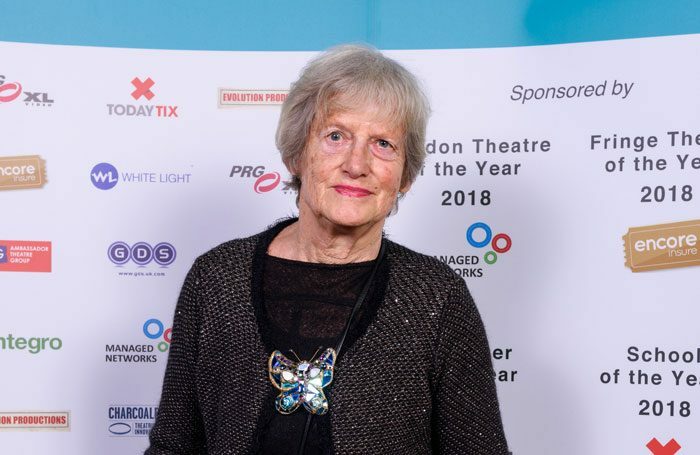 The Victoria Palace is arguably her finest achievement and we should all sing from the rafters a hymn of praise and thanks for what she’s done for the British theatre”. During a tour of the Grade II-listed 1911 Frank Matcham-designed theatre – looking more dazzling probably than it ever has done – Ferraby’s enthusiasm and pride in what has been achieved quickly overtakes any concerns about her well-being. 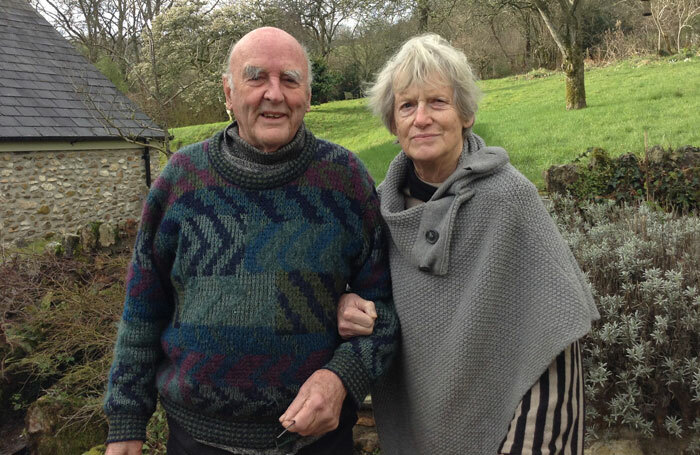 Born in Leeds in 1938, Ferraby puts her stoicism and tenacity down to Yorkshire grit. “When I feel strongly about something I will say so, and I don’t take no for an answer, even from Cameron,” she says. After a painting course at Sheffield College of Art she specialised in textiles at Manchester School of Art, followed by two years’ practical experience as a designer in Paris, Germany and Scandinavia. 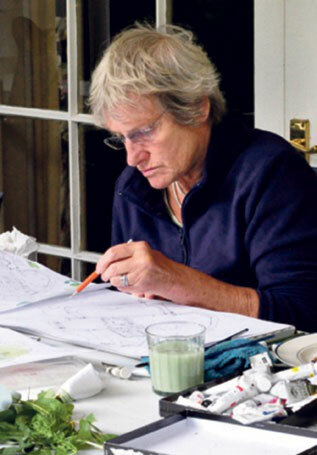 Ferraby set up shop as a freelance designer in London in 1963 when she was 25, and married Nicholas Thompson, a young architect, who went on to become a leading light of the theatre architects’ practice RHWL three years later. 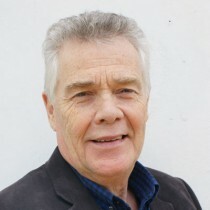 Not long afterwards, Ferraby and Thompson joined forces professionally on the construction and interior design of the ultra-modern Sheffield Crucible, a project dear to Ferraby’s heart as it was the city in which she grew up and where – at the old Sheffield Playhouse – she first became interested in theatre. The success of the Crucible – it won a Royal Institute of British Architects regional award in 1972 – set Ferraby on a professional course involving more than 80 projects across five decades. These included the creation or refurbishment of the Warwick Arts Centre – described by the then vice-chancellor of Warwick University as an “explosion in a Neapolitan ice cream factory” – the Theatre Royal, Nottingham; the Palace Theatre, Manchester; the Grand Theatre, Leeds; the Bradford Alhambra and the Theatre Royal, Newcastle. In London she worked on the Coliseum, Sadler’s Wells, the Old Vic, the Prince of Wales, the Palladium and the Lyceum, which she redecorated to blend in with Richard Hudson’s designs for The Lion King. Ferraby has also worked on concert halls from the Nottingham Royal to Manchester’s Bridgewater Hall, for which her design motif was inspired by birch bark. The commission for the Wigmore Hall required her to come up with a subtle upgrade of the much-loved foyers and a more radical approach to the basement restaurant. Perhaps more than anyone else in the last 50 years, Ferraby has been most responsible for the decorative tone and style of our greatest playhouses and concert halls. “I’ve always looked at the history of the theatres I’ve worked on,” she says. “It is important for me to have a feeling for the soul of the building before I develop new ideas. Every theatre has its own distinctive soul. With the older buildings, I look at the detail to understand the original designer’s intention. 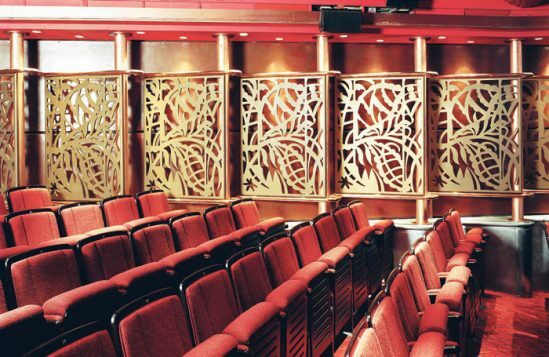 For the past three decades, Ferraby has worked on the systematic refurbishment of all eight Delfont Mackintosh theatres in London, in close association with Cameron Mackintosh. “We first met in 1981, when Cameron produced Blondel at the Old Vic and I’d just been working on its refurbishment for the then owner Ed Mirvish. Later Nick and I were summoned by Cameron to the Prince Edward Theatre for what we thought was an interview for a job, but when we got there we found he’d already decided we were the people he wanted,” Ferraby says. The sheer scale of the task of refurbishing Victoria Palace is mind-boggling. Ferraby seems to have refurbished every decorative aspect of the 1,550-seat theatre – with the help of a team of skilled artisans – from the dome above, now bathed in a blue glowing light where before it was unnoticeable, to the sumptuous Klimt-themed carpets underfoot, heavily influenced by Ferraby’s love of all things Viennese. She insists on an inspection of the toilets – “Cameron prides himself on his smart loos” – which are indeed things of comfort and good taste in the Victoria Palace Theatre. Even the fabric on the new seating in the auditorium was designed by Ferraby in green chenille. 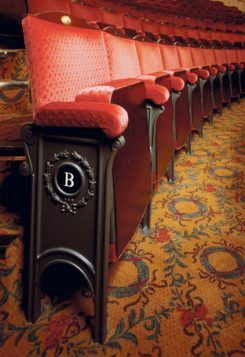 Comfortable and stylish seating with ample legroom is something that marks out a refurbished Delfont Mackintosh theatre.